It was a great night sleeping up high in our little sheltered spot. I even go out in the middle of the night to see what looked like northern lights! It wasn’t the strong green color I’ve seen in photos and more like a large milky way kind of look. It was really cool and I almost woke E knowing her work on the poles she’d know what it was, but I didn’t. It was really cool! 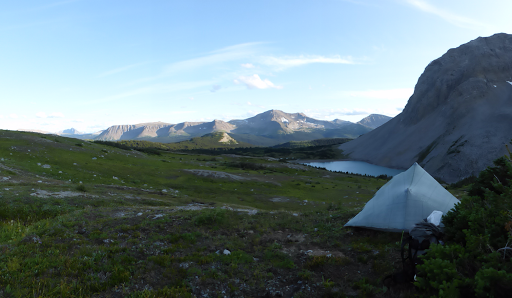 We got going at 6:30am, not sure of how long this day would take and wanting to set ourselves up to hopefully do two high route alternates tomorrow to get to Kakwa Lake, the northern terminus of the GDT. Can’t believe that’s already tomorrow and I think it’s too surreal for either of us to really believe it right now. Another thing we couldn’t believe was how great today was! We seriously had no idea it was going to be this great towards the end and it really is providing for quite the grand and relaxing finale. With how long the sun is up out here, we’ve hardly seen a sunset, sunrise, or even the moon. It is still light out well after 9:30 and I’m still not used to it. 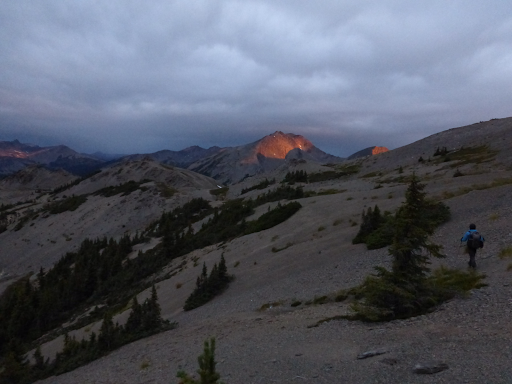 We got really lucky this morning, and got some of a sunrise as the sun broke through for a bit between the low clouds and the mountains making for a great pinkish color on the mountains as we ascended over the col along Mt Morkill. Again, we had no idea this was coming and all this has been a great surprise. 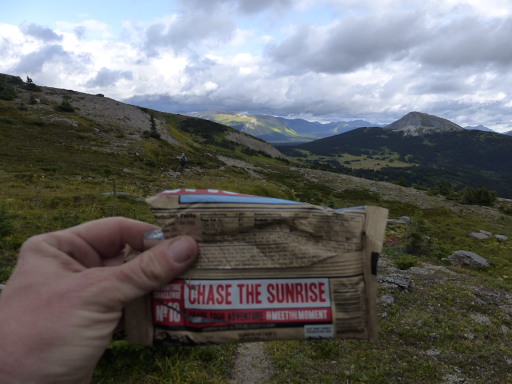 Later, in the morning, I had a Clif Bar and noticed the motivational quote on the wrapper was quite perfect for today. It was really windy, but thankfully dry. Our things were actually dry when we packed up today. I really love the texture of the clouds in the sky and we got plenty of that today. There was a mist of rain that came and went the first few hours of the day, but it was minimal. 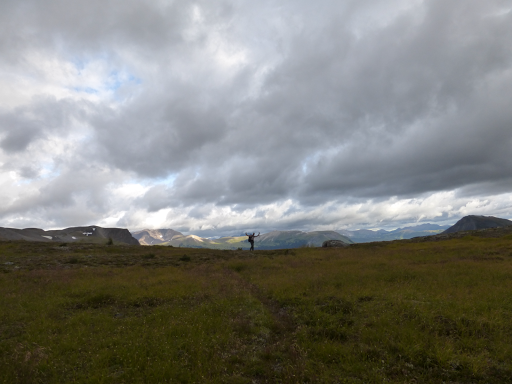 Almost all the hiking was in open alpine meadows. Most of the few hikers who describe describe this stretch in the notes we have say it has boggy wet meadows and mention little about how great the scenery is! We think that’s because it must have been socked in and raining for most of them. We are sooo grateful to get this string of dryness that seems rare up here, so aren’t experiencing the bogginess and rain that could really make hiking these stretches a drag. We dipped down to Featherstonehaugh Pass and then up on Featherstonehaugh Ridge where the clouds started to break and the sun started to shine through for brief moments. We were so content and pleasantly surprised again by all of this! We ate lunch at a small spot while the sun broke out and lounged to the fullest. We realized that for the first time in quite awhile, everything was was dry! We didn’t have to spend lunch unpacking and repacking all our gear! It was quite glorious. 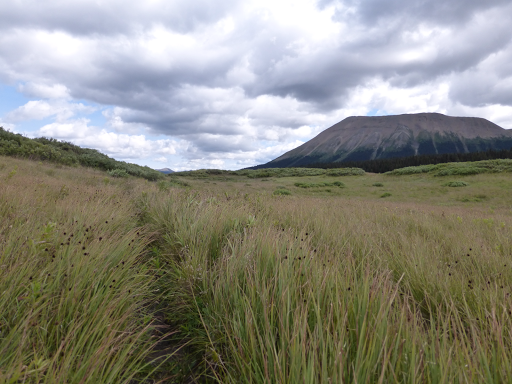 From there, we hiked through meadows a bit longer before heading up and over Casket Mtn Shoulder. Even knowing in our notes that most hikers miss the turn in the meadow to the shoulder, we missed it, but were able to cross country and connect to it, which ended up being quite clear and flagged. 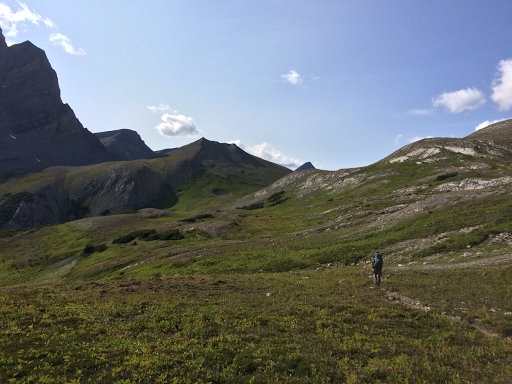 Then we dropped down to Sheep Creek area where, again, we could imagine the boggy muddy meadow that would exist most years. 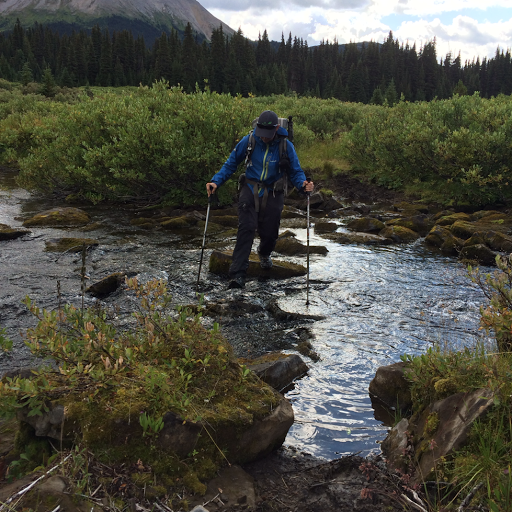 We continued to keep dry feet and hopped across the creek to another horsepacker camp. I’ve kicked myself for not taking more photos of these camps the last couple of weeks because some are quite elaborate. 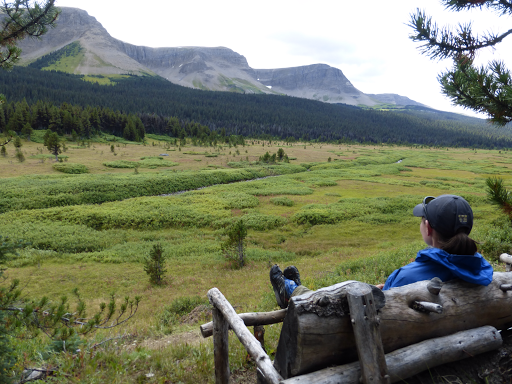 This one had two benches that looked out over the Sheep Creek Valley. We were on a very comfortable schedule with how smooth the trail had been all day and we took a bonus break on the benches. I tried to catch up on blogging that I’ve greatly fallen behind on and E totally lounged and took a brief power nap. I was quite envious of that! Maybe it’s being at the end of so many months of backpacking having done back to back trips for the past 5 months or maybe it’s being cold and wet, but I haven’t been able to stay awake long enough to finish journaling this leg. It’s probably a combination of both, but the plan has been to try and catch up midday at breaks when it’s nice out and I’m more alert. We had just a few more miles, and although it had been windy all day, the skies were clear for another night of camping up high if we could find a sheltered spot. We hiked up towards Surprise Pass and knew we needed to camp before the pass since we could see it was so barren up higher and the wind was very strong. As we headed up, we realized we’d gone too far and nothing protected was available for camping. It was only 5:40pm, but we knew better than to risk going over above tree line and having to hike a lot longer to find camping. We reluctantly turned around and headed back to the small groupings of trees we had passed and found one group that was sheltered enough around 6pm. Again, just surreal to have this view and we were able to look back and see where we had come from earlier in the day. What a great final stretch to end this hike! Plus, we got the luxury of not hanging our food for the second night in a row and fifth time this hike. One last note that my shoes (particularly the left one) are barely hanging on. 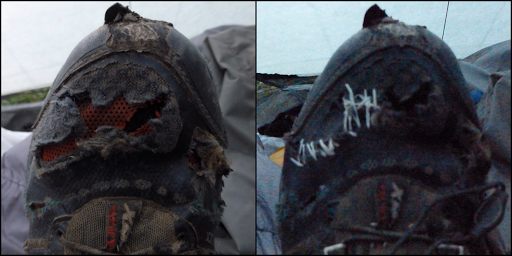 Now 600mi/965km on them, I made the risky decision to take them on this last leg rather than ruin a new pair. They are still the most comfortable shoes I’ve ever worn and the tread is great, but the mesh in the toe box have taken a beating in the brush. E wears more sturdy hiking Salomons, and they’ve done well. Tread is wearing balder, but they are only beginning to show signs of blowing out on the sides slightly. Today, my left one, which I sewed with dental floss a week ago, split all the way across the toe box. I sewed it up again tonight hoping it will hang in for the last few days. Pretty proud of my handy work. We are excited that tomorrow is technically the end of the GDT! Weather is lining up for a great ending too. 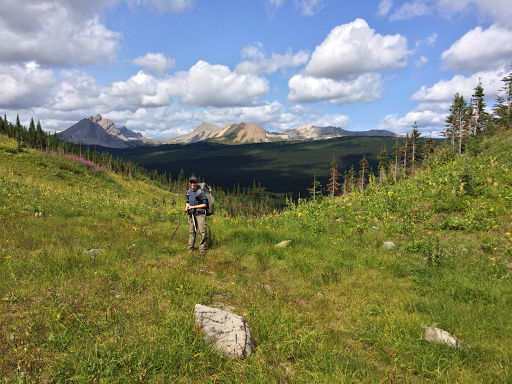 If it stays like this, we can do two high route alternates tomorrow to end at Kakwa Lake. There is still a day of hiking on a dirt road to get out after that, but Kakwa Lake is technically the end. So crazy that it’s already here!